It’s tradition for dance floors to be set off in some way. Usually, you can see foliage or strawberry placed around the dance floor, often a physical structure is built all around it so the dance floor has his own canopy of floral decor. While this sets the physical boundaries of a dance floor, demarcating it, don’t forget that the dance floor itself is a decor element. 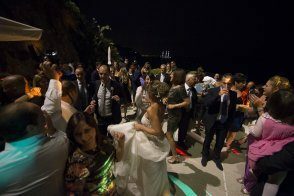 Some venues do not have dance floors, so you’ ll have to build or create it if you are planning to have an after dinner party. Laying a wooden floor is the most common way to create it. The beauty of wooden floors is that they can be painted and decorated to match the decor of the event. For example, Bride and Groom can personalize the dance floor with their initials painted in the center of the dance floor. Another method to be used for creating a highly unusual design for a dance floor is to digitally print the image of a pattern or other design onto huge portions of vinyl. These are then laid and fitted together to form the surface of the dance floor. It’s a wonderful decor effect because the dance floor is such a focal point of a room.